The internet is freaking out about Outback Steakhouse this morning, and the reason why is sure to brighten your day. In a statement released just hours ago, the restaurant chain announced that every single one of its current locations will be offering 200 pounds of raw steak to Amelia Earhart totally free of charge in order to coax her out of hiding! Yes! Just yes! Amelia, if you’re reading this, Outback just did something incredible for you, and they want you to know that if you’re out there, you can pick up your uncooked meat at anytime! “If you are scared to return to society because you think everyone will be mad at you for wrecking a plane, that’s simply not true, and we hope our steak offer affirms that,” the ad concludes. 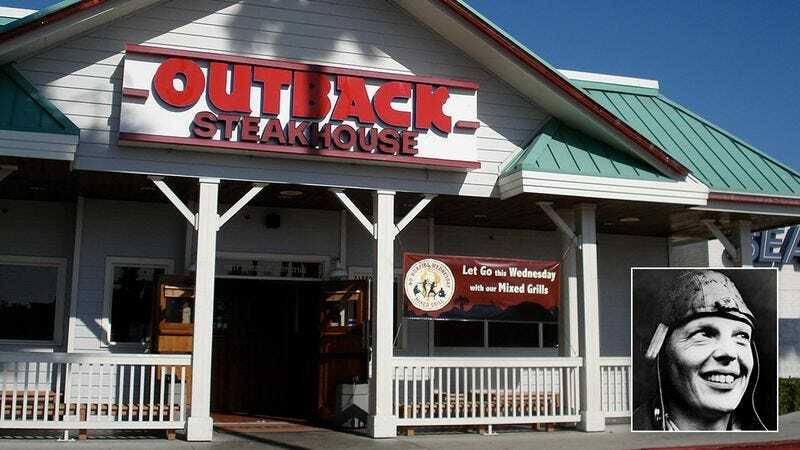 Outback, for its part, will require all its locations to begin setting aside at least 200 pounds of beef product in a separate, reserved part of its meat lockers labeled “Amelia.” And to sweeten the deal even more for the famed explorer, the company also said that if she’s not satisfied with the cuts that Outback has set aside for her, she should feel free to request different ones, including T-bone, strip steaks, or even delicious cuts of raw filet mignon! Hurry up, Amelia! Your time to claim this incredible, one-of-a-kind prize is quickly running out! But real talk, if anyone can lure Amelia Earhart out of hiding, it’s Outback Steakhouse. Best of luck to them with the rest of their amazing campaign!